We are a small family run operation. 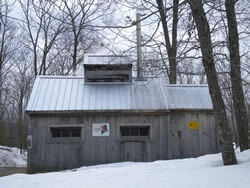 We have been producing Pure Maine Maple Syrup for the past 15 years. We try to keep the production as old fashioned as possible. Our goal is to produce a high quality maple syrup by paying attention to detail. We follow our family roots by offering French Canadian favorites Tire a L'erable and Sucre a la Creme. At farm (call ahead), Maine Maple Sunday- always the 4th Sunday in March.